Patrizia Lombardi, Sustainable Urbanism New Directions, Qatar University, 21 March 2016, © Qatar University. The need for a paradigm shift in order to progress towards sustainable development in cities is highlighted by Dr. Patrizia Lombardi. She focuses her analysis on the relations between cities and climate change, and the concept of the post-carbon city which has recently emerged as a concept emphasising the process of transformation, a shift in paradigm that is necessary to respond to the multiple challenges of climate change, ecosystem degradation, social inequity and economic pressures. Current reports on the state of the world and levels of consumption show that very little progress has been made in the field of sustainable development in cities (UN, 2014, IPCC, 2014). At the moment cities consume 75% of natural resources and about 67-76% of energy. In Europe, the finding is even more important (IEA, 2008). Moreover, considering energy vulnerability, the availability and price of energy is particularly crucial for cities which import all of their primary energy. Furthermore, cities are responsible for the majority of the world’s greenhouse gas emissions (71-76%). Although sustainable development and climate change have been debated for more than three decades, still a consensus is far away (Adams, 2008). The debate has certainly stimulated carbon reduction policies, leading to a relative decoupling in some industries, but these again were offset by ever continuing growth. Both in terms of availability of renewable resources and in terms of the environmental impacts of our consumption and production, we are pushing beyond the limits, leading to acceleration of extinction rates, ocean acidification, loss of clean potable water and so on (Rockstrom et al., 2009, Loorbach, 2014). I want to highlight the need for a paradigm shift in order to progress towards sustainable development in cities. The discussion focuses on the relations between cities and climate change, and the concept of the post-carbon city, which has recently emerged as a concept as it emphasises the process of transformation, a shift in paradigm that is necessary to respond to the multiple challenges of climate change, ecosystem degradation, social inequity and economic pressures. 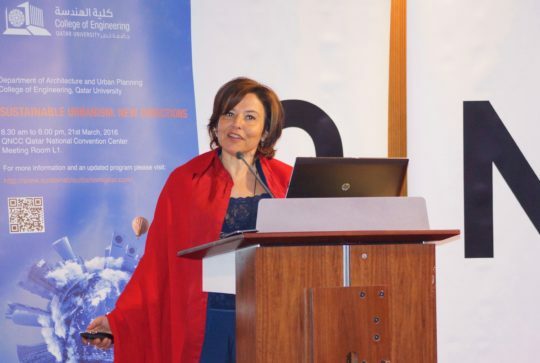 Patricia Lombardi, Sustainable Urbanism New Directions, Qatar University, 21 March 2016, © Qatar University. Cities are here understood not only as local authorities but also as complex, adaptive, social-ecological systems, including local ecosystem of inhabitants, companies, public utilities and local governments.I argue that resilient thinking approaches are more appropriate than current efficiency ones for supporting decisions towards post carbon city. Taking a resilient approach is critical to build redundancy into a certain interpretative model, as it comes with the classical adaptive cycle, encouraging us to look at the whole figure – reorganisation, conservation, release, exploitation – of the system. This argument is supported by literature review and case studies analysis derived from European projects. Prof. Dr. Patrizia Lombardi (PhD, Msc, BA/MA) is Full Professor of Urban Planning Evaluation and Project Appraisal, and Head of the Interuniversity Department of Regional and Urban Studies and Planning of Politecnico and Università di Torino (DIST). She is an established figure in the field of evaluating smart and sustainable urban development, publishing widely in the subject area and coordinating, or serving as lead partner, in several pan-European projects related to sustainable built environment, smart cities, post carbon society and cultural heritage, including Bequest, Intercity Infelicities, ISAAC, Surprise, Perfection, Milesecure-2050, Dimmer and Pocacito. Dr. Lombardi is Scientific Coordinator for Politecnico of Turin of the UNESCO Masters in “World Heritage and Cultural Projects for Development” managed by the Turin School of Development of the International Labour Organization (ILO). She also received an award from the Alumni of Salford University of the Great Manchester for her achievements (2012). Urbanista.org is a new webzine of critical perspectives on contemporary urban design and its responses to social, cultural, political and economic patterns globally. Page 1 + Urbanista/Colours/Red Mask Created with Sketch.